Smyth Performance will turn almost anything into a ute. We have always loved the Australian ute body style. The idea is basically to take a car and replace the entire rear half with a functioning pickup truck bed. These cars used to be popular in the US with models like the Ford Ranchero and Chevy El Camino, but the ute's popularity in recent years has been relegated to Australia. We have seen several awesome cars that have been converted into utes, which makes us wish that more manufacturers actually built them. These conversions aren't always great, but one company may have perfected the process. Smyth Performance in Wareham, Massachusetts specializes in turning cars into utes. We have featured their Dodge Charger in the past, and we are huge fans of their work. It seems like the company has only had the ability to make utes out of the Charger or the Volkswagen Golf/Jetta at this point in time. 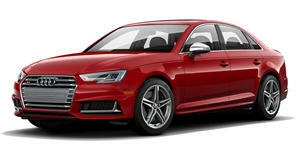 The company recently revealed its third project, an Audi A4/S4 ute. It appears that the first model is based on a B6 A4, with no word as to whether it was a 1.8T or 3.2-liter V6 model. Smyth says that it can also build S4 utes using the 4.2-liter V8 cars with 340 hp. These cars can be manual or automatic and can be based on either a FWD or Quattro AWD car. Smyth will also convert the B7 generation A4/S4, but we haven't seen what that creation would look like. The car retains all of its original functions and Smyth creates the ute by adding modified tail lights and a drastically altered tail gate to go with the modern look. We are big fans of these conversions, given that they're completely original designs. We hope this company really catches on so we can see some high-dollar ute builds in the future.